That really is a spectacular piece. I always marvel at the soft rendering and superfine detailing he's able to achieve with acrylics. As that's my medium I know how difficult and time consuming that really is. As a huge Michael Whelan and Brandon Sanderson fan, I feel faint. Seriously. Sanderson writes like an artist; his characters and systems of magic are unreal. To have Whelan coupled with that. Its sensory overload. That's a masterful, spectacular illustration. 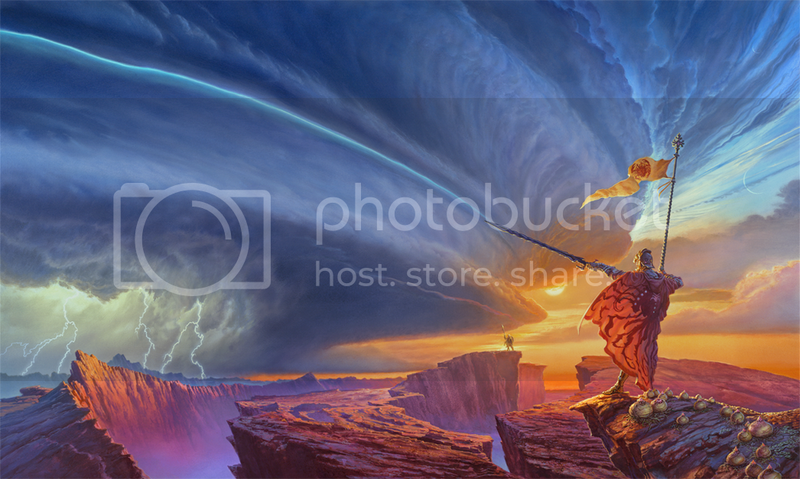 The sword/staff drawing a line along the curve of the thundercloud is a brilliant touch. Wow... that is a spectacular painting. Thanks for sharing this. I agree that we do not see new Michael Whelan work often enough. What a delight. I imagine Brandon Sanderson is thrilled with the cover. Ah! The marvelous skies of Michael Whelan. I think his skies are often a main character in most of his illustrations, they are dense, strong and impressive. He should give us a workshop on Fantasy Weather Conditions! Brandon's words here feel as if they are my own as well.